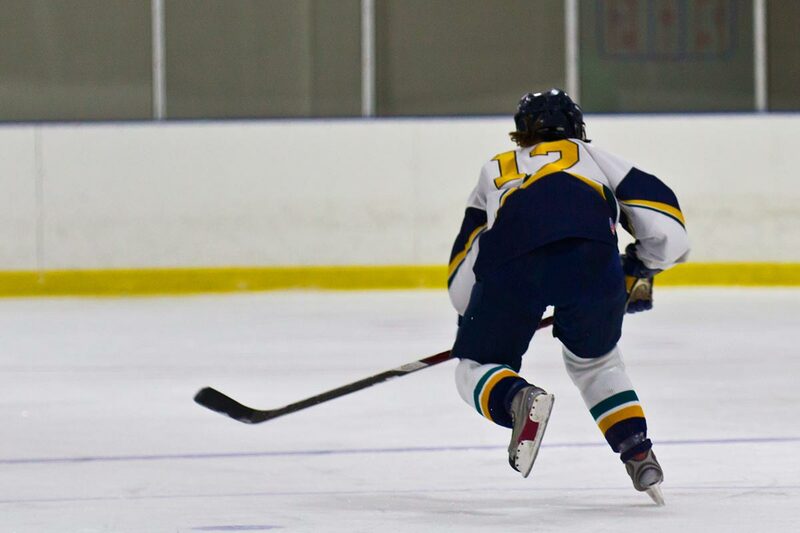 Integrate races into hockey drills | Ice Hockey Systems Inc. There is a mentality that you have to line the players up and do skating drills for 20 - 30 minutes to get your team in shape. However, have you ever lined up two players on the goal line, places a puck at center ice, and said "go"? Just watch as the competitive nature of your players brings the intensity to a new level. The hockey drills on this page are just a few examples of some conditioning and skating drills that place player vs. player and reward the fastest, hardest workers with a shot on net. This is a hockey conditioning drill that you can run on both sides of the ice. You can do many variations depending on how much skating you want the players to do. The diagram below shows the players skating from blue line to red line, back to the blue line, to the other blue line, back to the original blue line, and then racing for the puck that is set out by the coach. The player that skates to the puck first is rewarded with a breakaway. The next hockey drill incorporates more skating fundamentals and skills. Players line up next to the goal posts along the goal line. On the whistle the two players side step along the goal line and have to touch the boards with their stick. Then they skate forwards up around the top off the circle, transition backwards around the bottom of the circle, transition forwards again as they head up ice, and then race for the puck. Again, the first player is rewarded with a breakaway. You may also view the animation and additional details. Again, this drill places player vs. player but the skating skills required are geared for defensive players. This race only requires one zone so it is good for half-ice practices or split ice sessions. The players line up along the boards just outside the blue line. They skate forwards along the boards and transition backwards around the cone on the goal line. They skate backwards until the next cone and at this point they have to open up and transition towards the middle of the ice around the third cone and race for the puck set out by the coach.